Chemists use chemical formulas to represent the types and numbers of elements that make up substances. The smallest particle of any element on the Periodic Table is called an atom. All substances are made of molecules or atoms. A molecule is simply a group of one or more atoms. 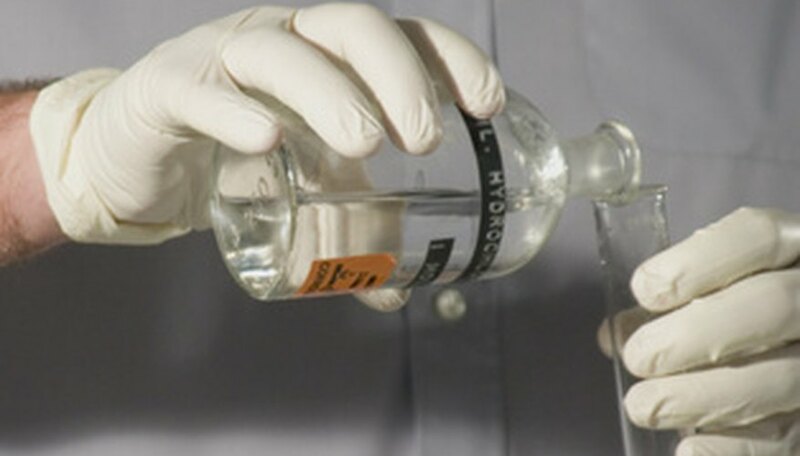 Chemical formulas tell you whether a substance is made of molecules or atoms, and how many of each. An element is symbolized by a one- or two-letter code called a chemical symbol. The symbol always begins with a capital letter, and if it is a two-letter symbol, the second letter is lower case. The symbols for all known elements are shown on the Periodic Table of Elements. A substance that consists of single atoms of one element will have a chemical formula that is the same as that element's symbol on the Periodic Table. For instance, gold is an elemental substance; its symbol, as shown on the periodic table, is Au. Some substances are made of molecules that consist of two or three atoms of different elements bonded together. An example of such a substance is table salt. The chemical formula for table salt is NaCl. The best way to determine how many different elements are present in one molecule of table salt is to count the capital letters in the chemical formula. Here, there are two capital letters: the "N" in Na and the "C" in Cl; therefore, there are two elements in the molecule. That there are no numbers present in the chemical formula means that there is one atom of each element present in the molecule. The Periodic Table reveals that Na is the symbol for sodium, and Cl is the symbol for chlorine. Put all this together and you can determine that one molecule of table salt, NaCl, contains one atom of sodium and one atom of chlorine. The molecules of many substances have multiple atoms of one element within them. The number of atoms of an element is revealed by the number that occurs after that element's chemical symbol. For example, take the well-known formula for water, H2O. There are two elements in water, "H" for hydrogen and "O" for oxygen. The fact that there is a number "2" after the symbol for hydrogen tells you that a molecule of water has two atoms of hydrogen. That there is no number after the symbol for oxygen means that a molecule of water has one atom of oxygen. Parentheses in a molecule means that the molecule contains many similar groups of atoms. For instance, the molecule symbolized by the formula B(OH)3 contains three elements: boron, oxygen, and hydrogen. The fact that the oxygen and hydrogen symbols are within parentheses means that they occur in a repeating group. The amount of times the group repeats is equal to the number after the parentheses. So this molecule, B(OH)3, contains one atom of boron and three atoms each of oxygen and hydrogen, and the oxygen and hydrogen atoms are bonded together. The numbers that come before a chemical formula tell you how many molecules are involved. The interpretation of this formula would read: Two molecules of hydrogen gas (2H2) and one molecule of oxygen gas (O2) will react to form two molecules of water (2H2O). Banas, Timothy. " Understanding Chemical Formulas." Sciencing, https://sciencing.com/understanding-chemical-formulas-6300361.html. 24 April 2017.